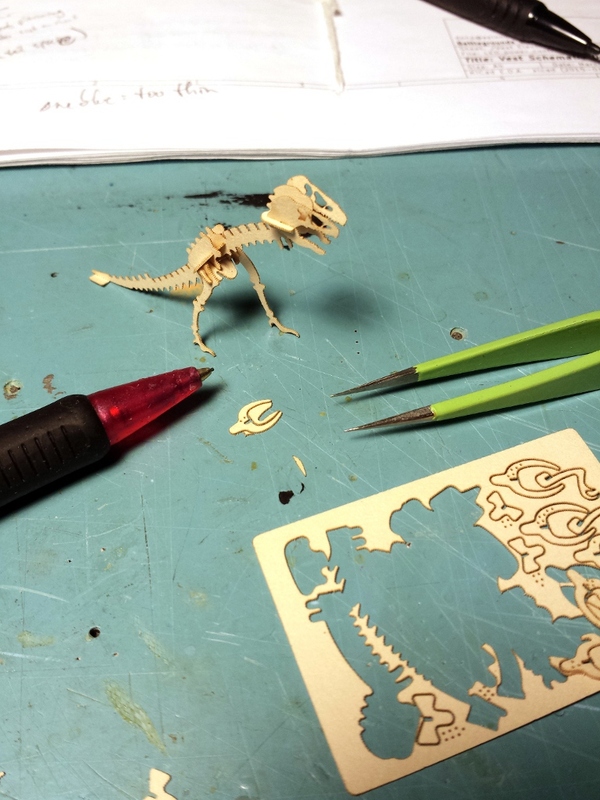 I have been experimenting with these tiny little dinosaurs. The design itself is not new (Epilog laser has the CAD file free on their site) and making them small isn't new either. The work and features I added are new, though. As is arming them with rifles. Going from the raw CAD file to what you see here (that's the tip of a mechanical pencil on the left by the way) was a lot of work - far beyond simply scaling the design down. Here's what I did. First, the CAD file needed to be cleaned up. Then I needed to do some tests to find the best material to use. I settled on some paper I sourced from an art supplies store - some cotton-based sheet that is both strong and thin. It's barely a third of a millimeter thick. Then I needed to find the best settings on the laser cutter for the material. This is always an involved process. Too high of power or too slow of cutting and the material gets scorched or otherwise cut too much - like using a knife that is too hot on wax; it melts things too fast. After finding the right power settings, I needed to play with the precise cutting and shape of the parts so that I can cut the design out and still have the pieces stay in place - instead of the tiny paper pieces being blown around by the compressed air coming out of the laser head. Then I needed to adjust the precise size of the slots so that the thickness of the paper and the width of the slots was a good match. I want the pieces to go together easily but not too loose of a fit. I also needed to find the best glue to use when assembling them. Once all that was done, I added some tiny marks on the pieces to help tell similar pieces apart from one another. This makes assembly easier. 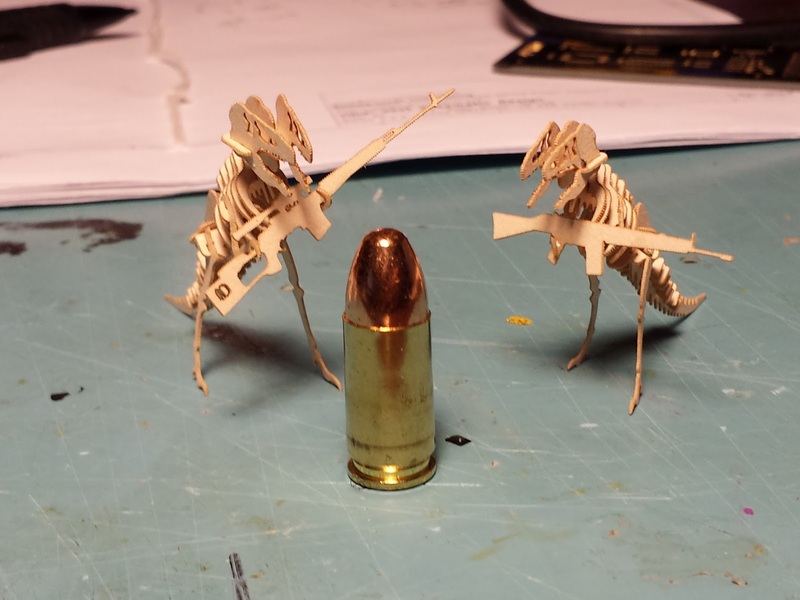 Finally I cut out some tiny little rifles as well! Now they are all set! The one one the left is holding an SVD and the one on the right, a G3. 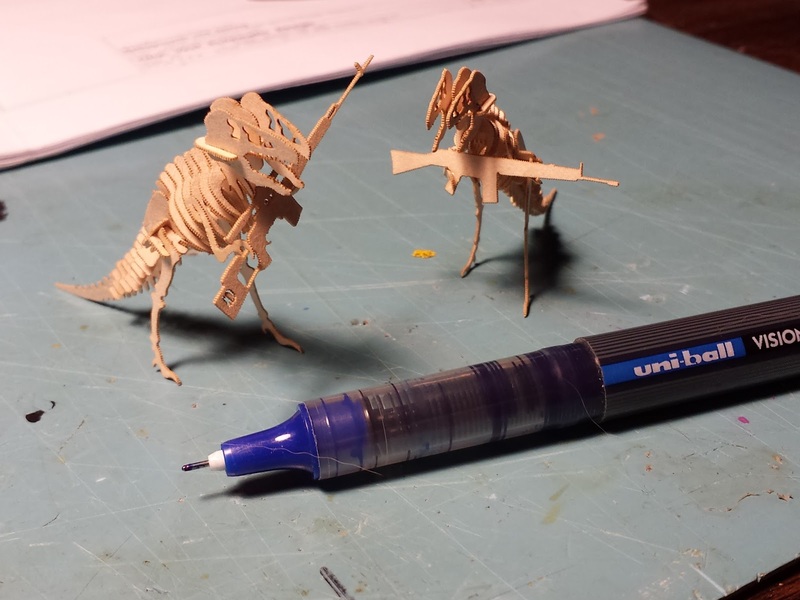 Go here for more pictures - I added Velociraptor hunting parties! 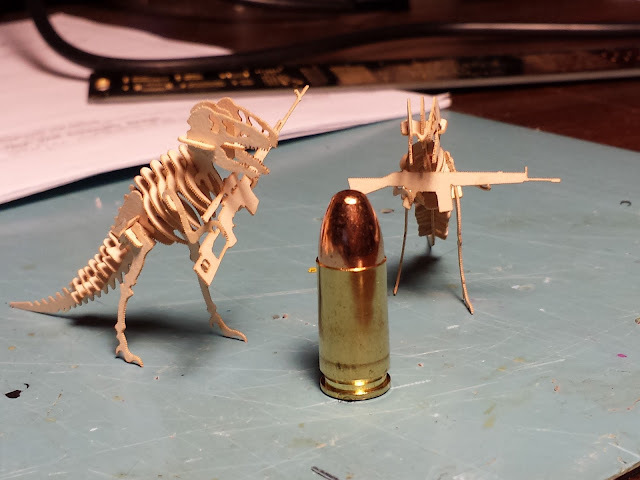 This isn't the only laser-cut gun project I've done. Don't miss my ALIENS Jumping Facehugger Popper target!